Each year, I do a retrospective analysis of this blog. This year, I found something unexpected. Like many other content sites, just a handful of posts on this blog generate the majority of the traffic. 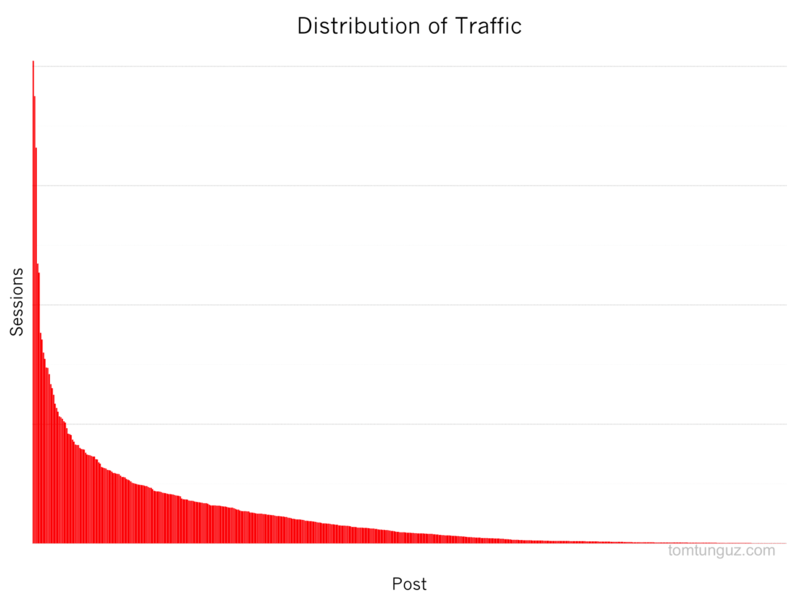 I’ve plotted the distribution of traffic by post above; it’s clearly governed by a power law. The top 2% of posts generated 19% of traffic, the top 10% account for 48% and the top 20% attracted 69% (Pareto would be vindicated). None of that data is surprising. However, the source of traffic for the exceptionally successful posts is unexpected. 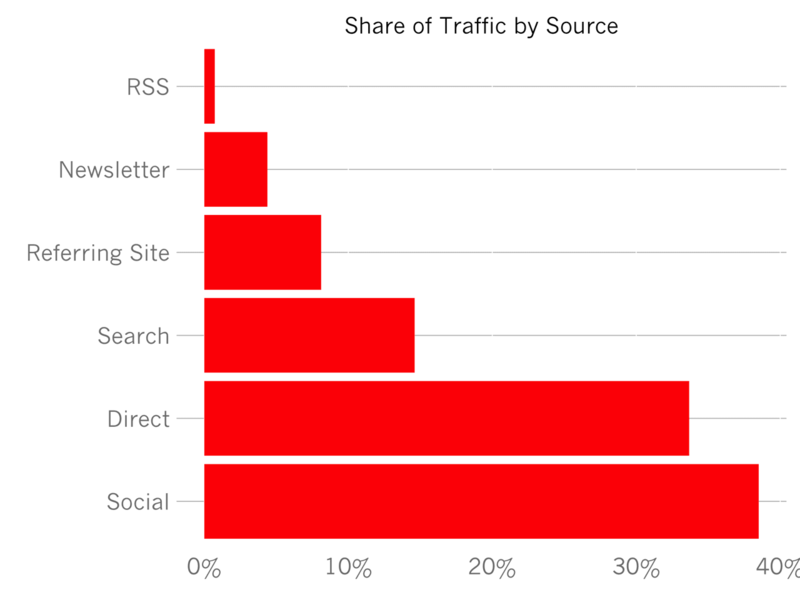 The chart above shows the share of traffic generated by each channel. Twitter and Facebook which dominate the social channels generate 40% of traffic in aggregate. Direct, people typing in tomtunguz.com, generates about 35%, and so on. This data naturally led me to the conclusion that social is critical for generating exceptionally successful posts. This aggregate analysis works in the case of normal or Gaussian distributions, but it breaks down when the data is governed by a power law. 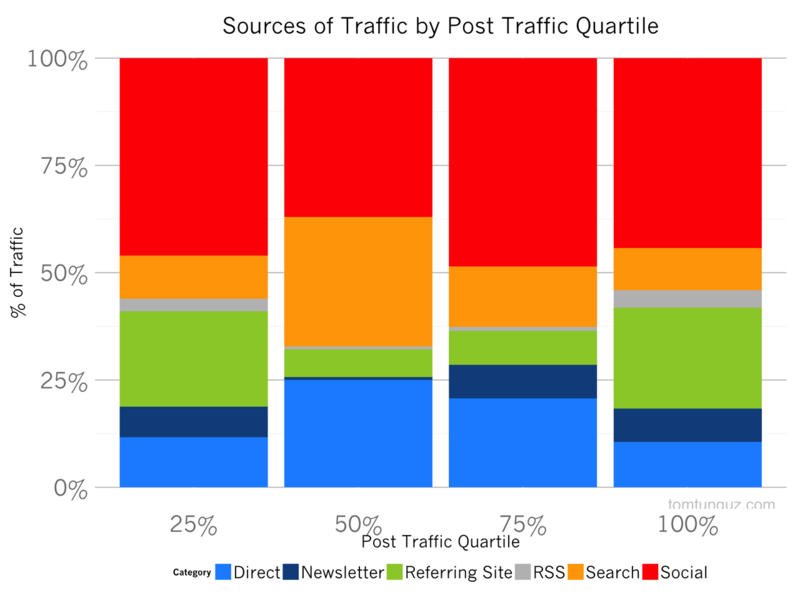 Let’s break down posts by quartile and look at traffic source for each of them. Social consistently generates about 40% of traffic across all the quartiles. Direct traffic is also relatively constant as a share of traffic across all posts. However, referring sites expands from about 5% in the 25th and 50th quartiles, but explodes to 25% of total traffic for the best performing posts. In retrospect, this makes sense. Highly trafficked sites send lots of referral traffic. When a blog post resonates with the readers of that site, some of them come to explore this blog more deeply. The data illustrates why content syndication and collaboration with other sites is so important for content marketing - a useful end of the year insight. Over the past year on this blog, Twitter followers have tripled, traffic has tripled and email subscribers have more than quadrupled. In short, everything is up to and to the right. I want to thank everybody for the inspiration, advice, feedback, suggestions and support over the past year. On to 2015!